SINGAPORE (Dec 26): The technology sector in Singapore is deemed to be highly cyclical and with the recent increase in global demand for electronic products and services, along with new entrants within the sector, competition has been heating up. However, the competition within the sector has an economic impact of weighing both prices and margins. Furthermore, the recent US-China trade dispute have also affected the technology sector’s supply and value chains, especially when the US announced that it would impose tariffs on industrially significant technology. In Singapore, the electronics sector PMI saw a drop of 0.6 point in November from the previous month to record contraction of 49.9. This was the first contraction record by the Singapore Institute of Purchasing and Materials Management (SIPMM) after the technology sector posted its 27 consecutive months of expansion in October. According to the SIPMM, the electronic sector’s contraction in November was mainly due to slower expansion in the key indicators of new orders, new exports, factory output and inventory. Despite this, employment index recorded that employment within the electronics sector saw its 25th consecutive month of expansion. 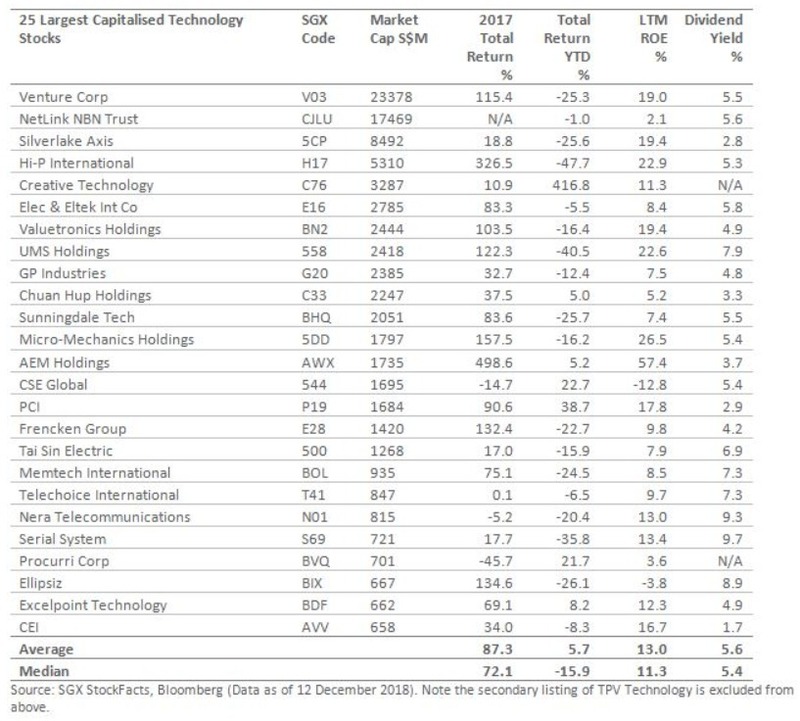 SGX notes that the median measure is used as Creative Technology posted a 416.8% return in 2018, which would have positively skewed the average total return of 25 stocks to 5.7%. In addition, the 25 stocks have an average return-on-equity (ROE) of 13% with the median ROE at 11%, but have averaged ROEs of 16% over the past five years, which also coincided with average annualised total returns of 15% for the 23 of the 25 stocks that were listed for the duration. The average price-to-earnings (PE) and price-to-book (PB) ratios for the 25 stocks are also trading at discounted to the five-year averages. Average PE is currently at 10.0 times, as compared to the five-year average PE of 11.6 times, while current average PB is 1.5 times, as compared to a five-year average of 1.8 times. The 25 stocks are also seen to have an attractive average dividend yield of 5.6%, which is reflective of the net positive cashflow associated with multiple stocks within the sector. These stocks also reported above average 40% volatility over the past 12 months. Venture Corp joined the STI in January and was since the most traded stock relative to market capitalisation within the STI for the first 10 months of 2018. Of the 25 stocks, seven stocks saw gains in 2018 YTD: Creative Technology, PCI, CSE Global, Procurri Corp, Excelpoint Technology, AEM Holdings and Chuan Hup Holdings.